For those operating hydrology networks, OneRain’s Field Decoder Solutions allow in-the-field analyses of gauge data messages for trouble-shooting, verification, and optimizing gauge network performance for ALERT/ALERT2 flood early warning systems and field instrumentation maintenance operations. 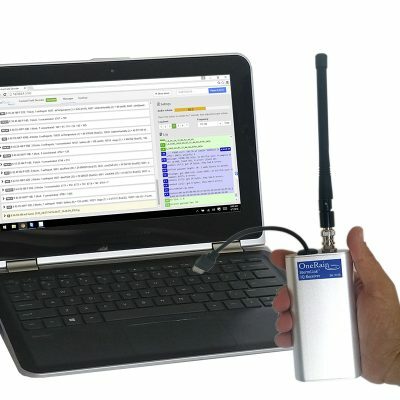 When the Contrail Field Decoder Software is used with the StormLink IQ Receiver, you have a simple low cost mobile solution for receiving and decoding your field sites. Through the web browser interface, you can easily change between frequencies, and decode ALERT2. The ability to switch between ALERT or ALERT2 decoding; simultaneous decoding of multiple frequencies using either ALERT or ALERT2. You will be able to see a message as it goes completely through your network—as it is sent from a transmitted site in one protocol, and then repeated through a repeater in the same or another protocol. Troubleshoot gauge sites before driving away—receive and decode ALERT and ALERT2™ radio signals directly onto your laptop. Verify that transmitter and configuration is correct before leaving a site. Simultaneous decoding multiple frequencies and protocols. See the decoded message content. You can verify the Source Address, Sensor Configurations, Transmitted Data Types and Values. Display standard P, N, C, and A messages per the ALERT2 specification. Built-in decoder tool on the display allows you to convert any P,N,C, or A message into its decoded components. Free software updates for one year included with your purchase of Contrail Field Decoder software. Message creation and transmission for two-way testing of ALERT and ALERT2 field components. StormLink Monitoring Station combined with OneRain’s Contrail® 24/7-supported real-time data collection, processing and web-based decision management tool, tracks critical information and delivers early warnings to alert first responders and emergency management personnel of changing conditions or threatening events. administer it for your users. This is a “pay as you go” subscription model to add more web views and sensor data sources. Some features and functionality may not be available in this shared edition. Contrail Server—a OneRain-hosted virtual server resource running the full version of Contrail Base Station software in our secure industrial data center. Contrail Server is OneRain’s managed and hosted application service edition of Contrail that delivers the full feature set of Contrail Base Station (includes Contrail Analytics and Contrail Inventory Plus). Fixed subscription cost allows you to extend and load it with as many data sources, web views, custom reports, etc., as you require. Visualize and design your real-time monitoring network, tracking capacity, available capacity, and data latency. Contrail® ALERT2™ TDMA Manager enables realistic ALERT2 network design in visual form.